Peanut butter and chocolate aside, there are some things that seem like an unlikely match yet go well together. In the case of Treemo’s Tic-A-Tac Poker, the adult game of poker has been combined with the childhood game of Tic-Tac-Toe to make for one of the most interesting casual games to date for Apple’s iPhone and iPod touch handsets. Log in, create a user profile, specify whether you want your location tracked and Tic-A-Tac Poker offers the three following games to play: Tic-A-Tac Poker (Tic-Tac-Toe using cards as playing pieces. Users can discard a given number of cards and create pairs, straights and other combinations which are compiled for bonus points at the end of the round), Draw Poker (conventional three or five card draw poker – the game has the player choose from the cards in a winning hand to play Tic-Tac-Toe with at the end of the round, the player using their cards to create card combinations in the grid for bonus points) and Poker Challenge (the player uses poker cards within a Tic-Tac-Toe grid to create progressively difficult card combinations as the levels go by). Tic-A-Tac Poker doesn’t go for bleeding edge in terms of graphics and sound, nor does it need to. Instead, the game presents the player with a bright, clean look while sharp, realistic sounds offer the feel of being at the dealer’s table. Despite the title’s mature theme of poker, there’s no money to win or lose here (or clothes to discard). Instead, scores are uploaded to a community Web site for others to browse through. The game then continuously tracks and uploads scores provided the player is logged in and an active forum community allows players to discuss gameplay and tactics. Tic-A-Tac Poker is a strange mix between two disparate things, but Treemo pulls it off well and with style. Even if you don’t have a weekly card game to go to, this is a fun way to kill 10 free minutes. For players just getting into poker, the game lets you become familiar with the hands and play strategies before venturing off to a $5 card game with friends. After several hours of play testing, the application crashed to the iPhone’s home screen once. Otherwise, the game is quick, stable, responsive to the handset’s touchscreen interface and performs well under steady use. Tic-A-Tac Poker doesn’t push the envelope for graphics or sound on the iPhone but does combine two interesting things into a unique game that keeps the player wanting to play one more round or try the next level. It won’t make you Danny Ocean and rolling over the nearest casino with your newfound poker skills are a poor idea at best, but for $2, it’s hard to go wrong. 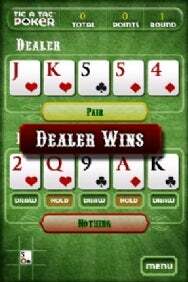 Tic-A-Tac Poker requires iPhone OS 2.0 or later to install and run.